Frittatas are Italy’s version of an open-faced omelet. They can contain any kind of ingredients and usually pretty healthy (depending on what you put in them). The one thing you can rely on is that they are always easy to make and packed with protein. In this incarnation, we’ve added zucchini, red pepper, sweet potato to the recipe along with fresh basil and a bit of sea salt. We’ve put together a sweet potato frittata but you could really throw any fresh veggies in. Frittatas are a great way to give a second life to leftover cooked veggies from last night or that half of a cauliflower from yesterday’s lunch. Frittatas are healthy, easy, and packed with protein. 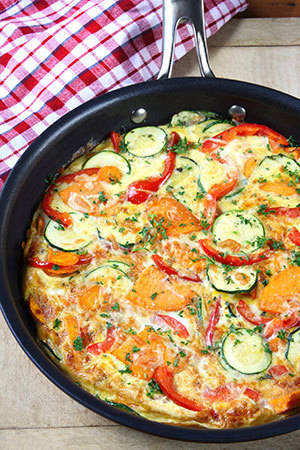 Our zucchini, red pepper, sweet potato frittata recipe is loaded with fresh veggies and tastes delicious. Heat oil in 10-inch nonstick skillet over medium heat. Add zucchini, bell pepper, and onion; cook, stirring frequently, for 2 minutes, or until zucchini is tender. Add sweet potato, basil, and salt. Increase heat to medium-high; cook, stirring frequently, for about 30 to 60 seconds, or until the moisture has evaporated. Reduce heat to medium-low. Add eggs. Mix well; cook, without stirring, for about 2 to 3 minutes, or until the bottom is light golden. As it cooks, lift the edges and tilt skillet so uncooked eggs flow to the edges. Reduce heat to low; continue cooking, covered, for 10 to 12 minutes, or until knife inserted in center comes out clean. Garnish with reserved basil; serve immediately. Double the serving size or add an additional protein and FFC for a great breakfast option. Add veggies or a side salad for lunch.